I know I have talked about my frizzy locks quite a lot here on my blog and I've tried quite a few products too. Some I absolutely love and would bulk buy and others which have been so disappointing and have even exacerbated the frizz situation. For about 6 months now my hair has been only slightly frizzy and I think thats down to me only washing my hair once or twice a week. Also every other week I always use the Joico conditioning treatment which has been a godsend, I blogged about that product here. 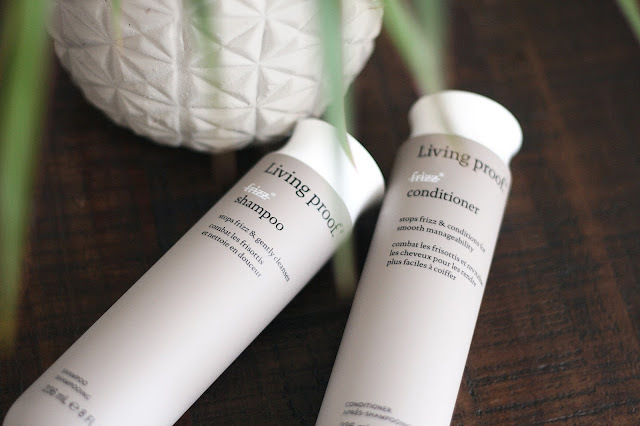 I have been using Living Proof for around 6 weeks now so lets get into the review! Ok the packaging... It's totally stunning and easily recognisable, I spotted the collection as soon as I stepped foot in my local Sephora. Its super chic and I love the bottle shape and the dusty greige tone! The applicator is easy to use and I like that it has a flat top so when I'm nearing the end of the product I can pop it upside down and make sure I get every last drop from the bottle. Overall looks are a big thumbs up! 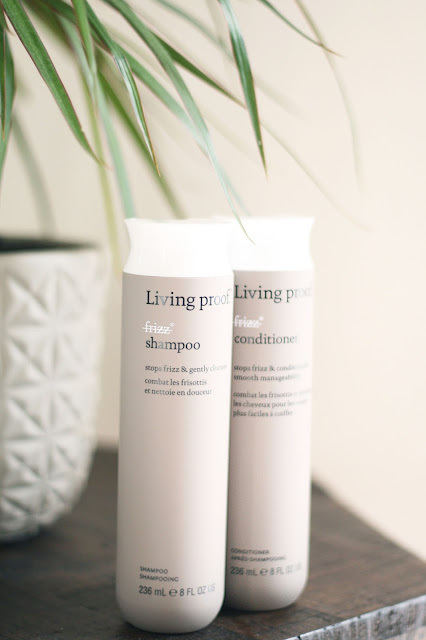 On my quest for healthy products I was pleased to find that Living Proof products are free from silicone and sulphates, instead of using those nasties they developed and patented their own Healthy Hair Molecule (OFPMA) which has been proven to block humidity by 70% than the most widely used anti-frizz products on the market that use silicone. Did it work for me? The shampoo and conditioner which are ok to use on colour treated hair both have a very gentle sophisticated scent which I enjoy using. The shampoo is a light creamy consistency and once warmed up in my hands lathers up well. I am always overly generous with my shampoo amount just because I have thick hair and want to make sure I cover every strand but I have tried being more economical with this product and I still achieve the same great lather that covers my full head of hair. The product washes out easily without weighing down my hair and no horrid residue. I also only use one shampoo unless I'm colouring my hair and I need to give it an extra clean. The conditioner is a thicker consistency than the shampoo but it still has a lovely creamy feel to it, and a small amount goes a long way too. I usually leave it on for around 2/3 mins whilst I get on with the rest of my shower routine and sometimes I even comb my hair through but this is definitely not necessary. This conditioner feels so good on my hair and washes out easily too leaving my locks knot free and super silky with no greasy feel to my hair. After blow drying my hair it definitely looks smoother and much more manageable, I used to hate straightening my hair but after using the no frizz system it has cut down my styling time significantly. One of the main things I have noticed is that my hair stays frizz free for around 3/4 days and thats with me doing hot yoga too, so if you live in a humid place or work out a lot I think you will find this system helpful! My hair simply feels weightless smooth and shiny and is much more manageable day to day. I would 100% repurchase even though it costs $25 each I think its worth it to have a healthy product that works. If you wanna try it out before you commit to the 8oz you can purchase a 2oz for $10. Have you used Living Proof before?